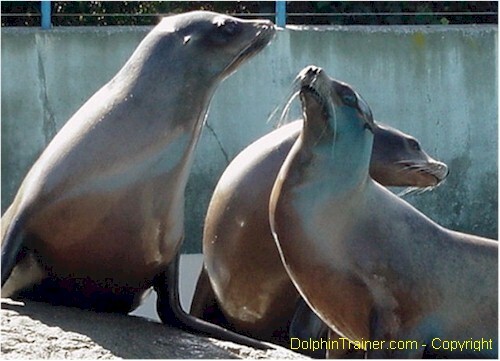 Have you ever wondered how to tell the difference between a seal and a sea lion? Well here are a couple of easy ways to spot the difference. 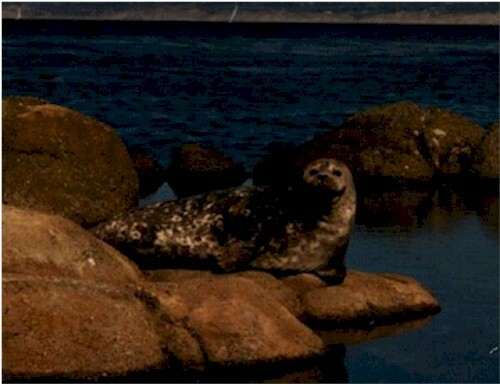 2) Sea lions have large front flippers. They can rotate their rear flippers under their bodies and can walk very well on land using all four flippers. 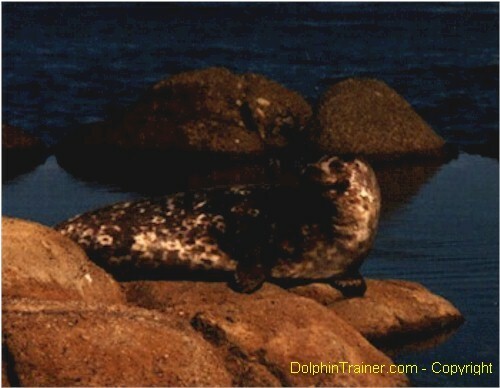 Seals have small front flippers and can not rotate their rear flippers under their bodies. They are rather awkward on land and generally move "inch worm" fashion. 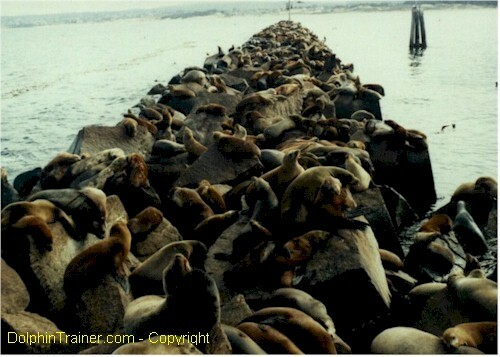 California sea lions are very gregarious animals. That is they usually like to hang out in groups. 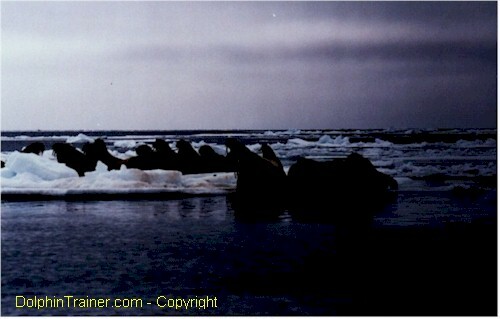 This large group of animals are almost all males. The two sexes generally don't mix as adults until the breeding season, usually around June. 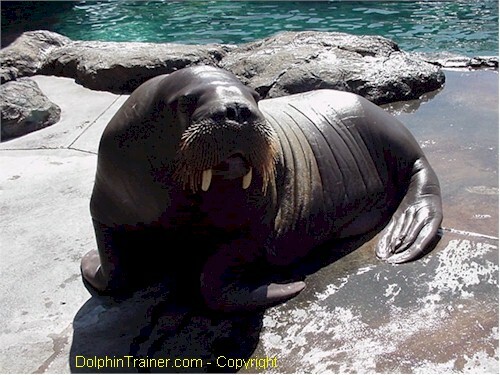 Walruses make up the third family of pinnipeds, Odobenidae. 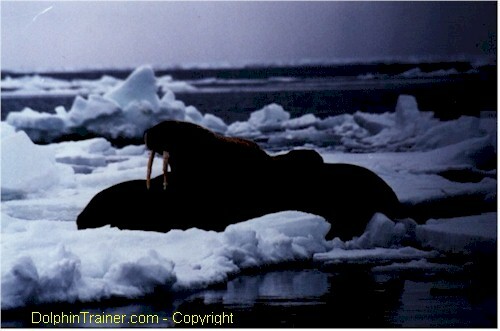 These two animals are Pacific walruses (Odobenus rosmarus rosmarus). Both males and females have tusks. 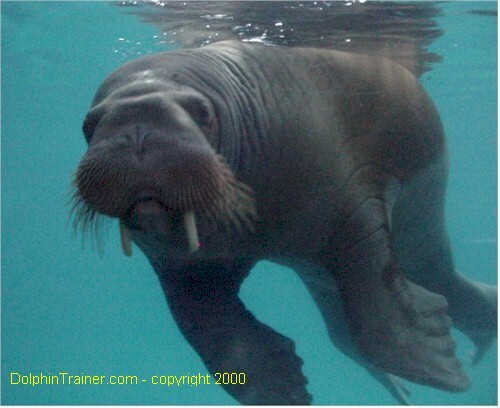 Walruses are more closely related to sea lions than seals, but have physical characteristics of both. 1) They have large front flippers and can rotate their rear flippers under their bodies. 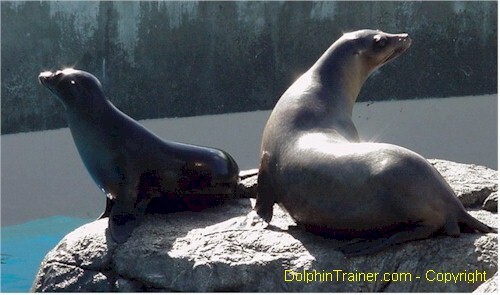 They can walk very well on land using all four flippers like a sea lion. 2) Walruses do not have external ear flaps. They hear through tiny, barely visible holes on the side of their heads, like seals. Walruses are pretty gregarious animals too. The wild population of Pacific walruses seems to very healthy, numbering about 250,000 animals. This is probably very close to their historically high population number. They can often be seen in groups measuring in the hundreds of animals. 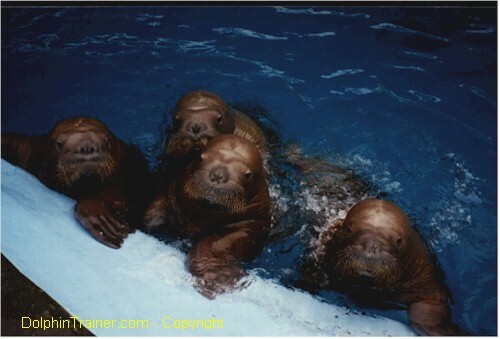 These four walruses were hand raised and really like to interact with their trainers. Perhaps because they are such gregarious animals, they now just considered people to be part of their social group.